This is a minor post, which is some sort of a completion to the previous post dealing with the same topic only for using MVC. So, if you require background, you may want to consider reading that post first. 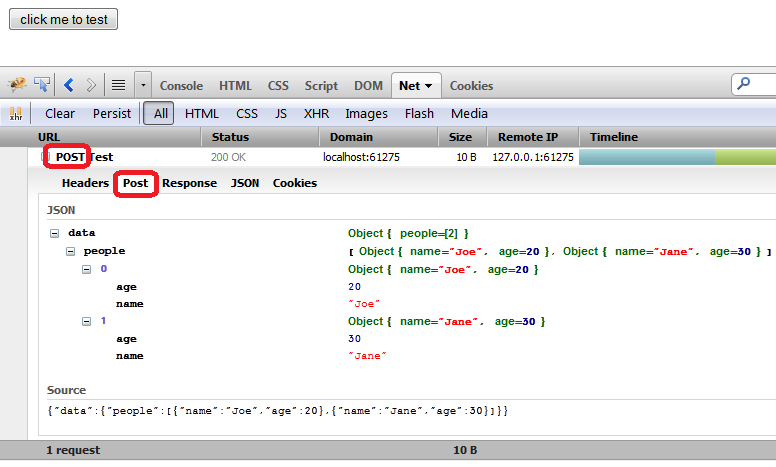 Fortunately, ASP.NET Ajax makes it really easy to send JSON back and forth. Using jQuery, there is some tweaking that had to be done in order to get this to work. However in WebForms usnig ASP.NET Ajax PageMethods or WebMethods – ASP.NET takes care about the technical details, leaving you to implement only the logic. Note that the same technique and guidelines are used just like in MVC: the data is sent from the Client browser to the Server using POST and in JSON format, with a Content-Type of application/json. All properties must match in data-type and names. As you can see for yourself, this is pretty much straight forward. ASP.NET Ajax client infrastructure takes care to POST the data and send it in JSON format and the appropriate application/json content-type, which is great. 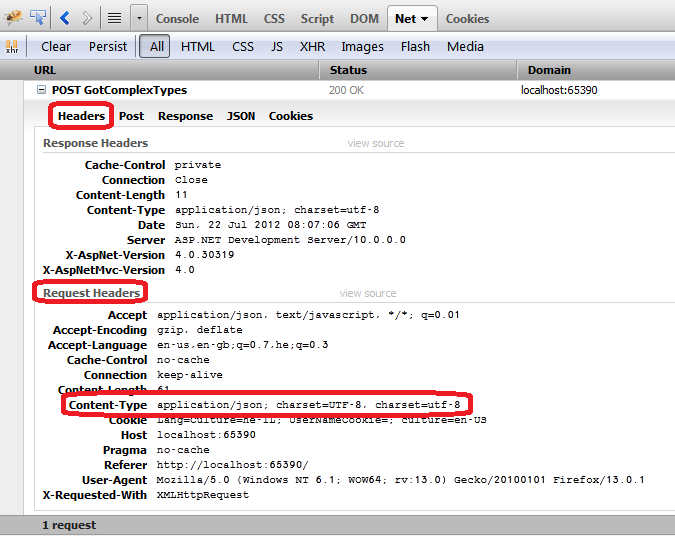 This post demonstrates how to send Complex client types to MVC using JSON. If you require the same information but for ASP.NET WebForms, you can go and read this post instead. Note: I published an updated post for MVC6 and ASP.NET core here. If you’re just into the solution, click here. If you would like to see some basic examples and the problem explained, read on. ‘Simple’ demonstrates sending two simple types and the server receives them “as-is”. ‘Array’ demonstrates that you can send simple typed arrays using $.param with the traditional flag set to true. The server receives them as expected. ‘ComplexType’ shows an even cooler example, that you can send an simple object and receive it’s properties on the server side similarly to the ‘Simple’ example. 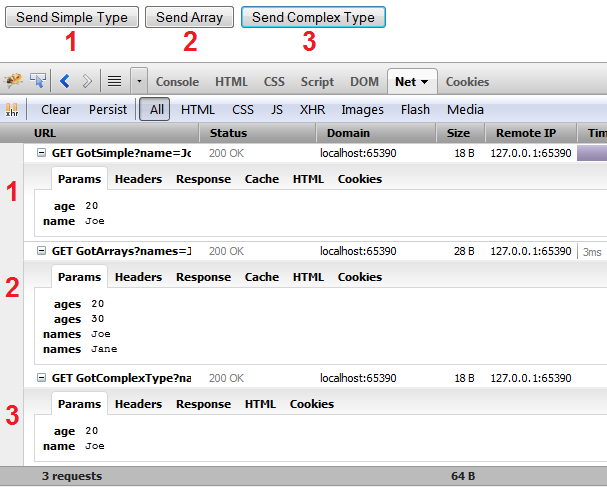 Note the traffic sent over to the server: ‘Simple’ (1) and ‘Complex’ (3) send the data exactly the same way, so clearly the server handles the sent data in a similar way. 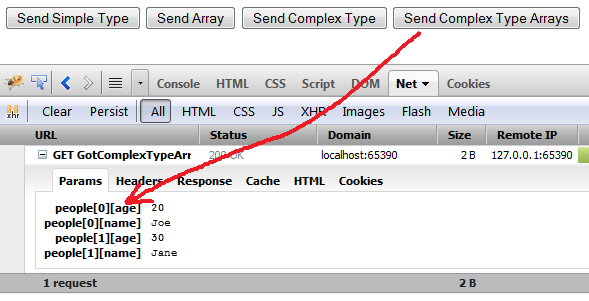 ‘Array’ (2) sends the data in duplicate keys which is received and interpreted by MVC as arrays. Unfortunately “data” is just an object, nothing more, and I did not get what I wanted. 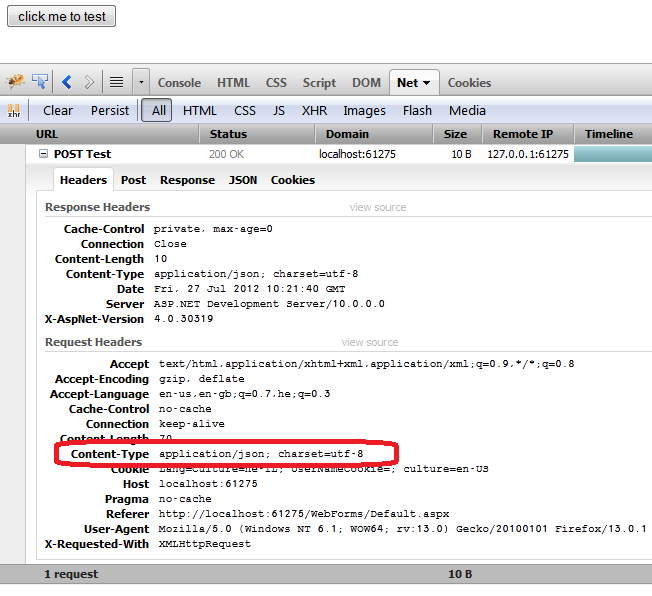 (Client) You must send a JSON content-type in the form of: ‘application/json’. (Client) The data must be POSTed and in JSON format (use JSON.stringify). (Server) All properties must be, well, Properties (e.g. get;set; implemented). Can’t use global fields. They should also be public. (Server) Apparently the name of the argument cannot be identical to one of the properties. I’m not sure why, but this seem to confuse the binder and results in ‘null’. So you cannot call your argument ‘people’, and have a ‘people’ property in that class at the same time. At least not in the immediate class of the argument. The above code ensures that Ajax calls sent to the server are with a JSON content-type, and that JSON is to be received from the server (you may choose to add more global jQuery Ajax settings here such as error handling, or POST method etc.). Important: if you don’t need all of your Ajax calls to be in JSON format, you can simply use the dataType and contentType in explicit Ajax calls. Just replace $.post with $.ajax and use POST. The code above converts the data into JSON format, and will require a ‘people’ property on the server side for binding purposes. Below is the modified server side code. It receives a ‘data’ (not ‘people’ – remember? ), performs binding to the different attributes, matching name to name and data type to data type. Properties and not global fields. Apart for being a really cool feature, to be able to bind JSON strings to server side objects, it can save a lot of effort if you thought of doing so yourself. However, this was no picnic. If you don’t follow “the rules” specified above, expect a hard-time and lots of frustration. But don’t despair – it’s worthwhile once it works, and after the first time, its supposed to get much easier.